To celebrate the fifth anniversary of her creation, Vocaloid Hatsune Miku will be releasing two best-of albums simultaneously. 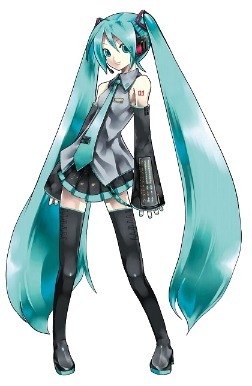 Since making her debut in Japan on August 31st, 2007, Miku has garnered a huge amount of attention and fans. To mark this huge occasion for the pop culture icon, two best-of albums titled "Hatsune Miku 5th Birthday Best ~memories~" and "Hatsune Miku 5th Birthday Best ~impacts~" have been confirmed for a release on August 1st. The albums are a collaboration project between Sony Music Direct and Dwango Music entertainment, following in the vein of her previous albums "Hatsune Miku Best ~impacts~" (2009), "Hatsune Miku Best ~memories~" (2009), "VOCALOID BEST from Nico Nico Douga [Aka]" (2011), and "VOCALOID BEST from Nico Nico Douga [Ao]" (2011). The best-of albums will include a wide range of songs, from her popular videos on Nico Nico Douga totaling over 1 million views to her latest and greatest songs from 2012, as well as two new songs written especially for the albums by Vocaloid producers titled "Anniversary Song" and "Birthday Song". A DVD has been planned for the limited edition versions of the albums so that fans can have physical copies of the videos for some of the most popular Hatsune Miku songs. Although the track lists for both albums have yet to be revealed, the "memories" version of the album will contain hit songs such as "melt", "Hello, Planet. ", "FREELY TOMORROW", "Kagerou Days", "Electric Love", and more for a grand total of 19 songs. The "impacts" version will contain the same number of songs, but will feature tracks "Matroshka", "Senbonzakura", "Koi Suru [email protected]", "Nijigen Dream Fever", and "Akatsuki Arrival". Stay tuned for more on Hatsune Miku's two new best-of albums, and check out the covers for them below! Sawagi to release 1st full album, "Punch Games"